After yet another good night’s sleep and fantastic breakfast, we were still undecided on what to do that day. We got talking to Jose (the owner of the hotel) and asked him if he could recommend a nice restaurant in Yaiza at which to have lunch that day. He recommended La Bodega de Santiago, which is in Yaiza and within a 15-minute walk of La Casona de Yaiza. Having never heard of it, and as you do – we googled it! We were surprised to find that it had fabulous reviews on TripAdvisor and decided that we would head there to eat later. To be honest, the weather that morning was very overcast but still warm. Eventually, still not knowing what to do, we just got in the car and started driving. The scenery in the south of the island is truly stunning, and we hadn’t really visited for many years. 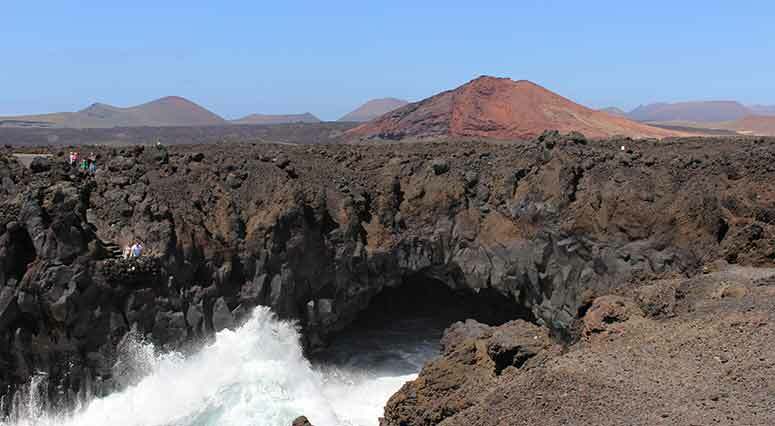 We decided to do a mini south tour, driving through Timanfaya (fire mountains), and on to El Golfo (the green lagoon) and the Salinas de Janubio (the last remaining salt flats). 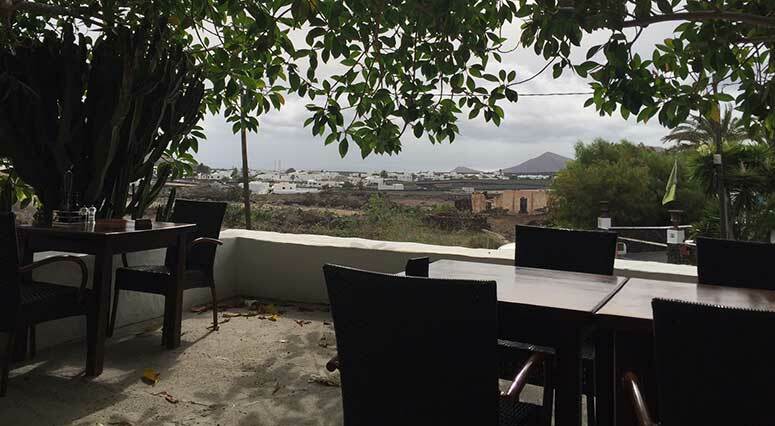 Carrying on to Playa Blanca, we decided to visit Marina Rubicón. 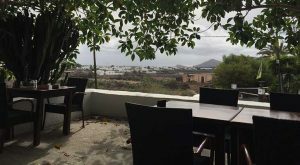 We parked and strolled around the marina, visited the new Rubicón shopping centre, and then carried on to Playa Blanca town centre. Playa Blanca was bustling with people and the walk along the well-built promenade and the gorgeous views across to Fuerteventura was really enjoyable. Starting to get hungry we headed back to the hotel to freshen up and head to La Bodega de Santiago. Thanks to the cut through Jose had told us about, we actually cut about 5 minutes off the walk to the bodega. Walking towards the bodega, you could be forgiven for wondering if it was just someone’s house. It’s very understated with only a small sign out front. 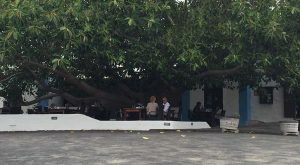 However, as you get closer, an enormous and very impressive rubber tree emerges in front of the bodega, with seating underneath it. 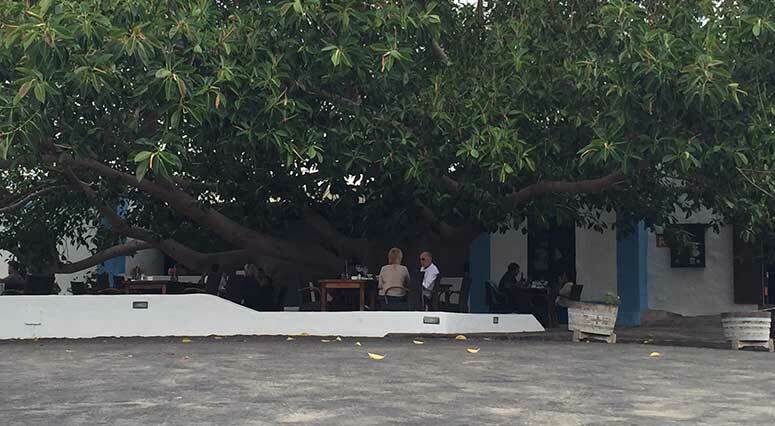 We settled at a table under the rubber tree and ordered a bottle of the local white wine whilst we perused the menu. At the start of the menu is a very endearing little snippet of history about the bodega. 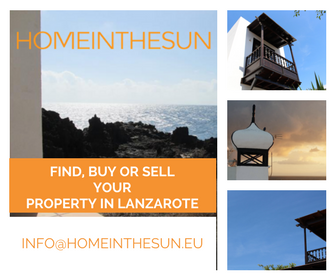 The house was originally built by Santiago Eugenio in the 19th century. It was restored in 2003 and opened as a restaurant in 2005, named La Bodega de Santiago in his memory. Furthermore, the chef has dedicated some of his oldest recipes to Santiago and these dishes are highlighted throughout the menu with the use of ‘Santiago’ or ‘La Bodega’ style. The bodega offers quite a varied menu with main course prices ranging from 10€ to 22€. A pleasant finding for us was fresh foie, not something you see on menus here very often. Having both decided on the same main course, solomillo con foie fresco (fillet steak with fresh foie) mainly because of the foie – we decided to order langostinos al ajillo (large langostine prawns with garlic) to share as a lighter starter. We weren’t disappointed the langostinos were served differently to the usual gambas al ajillo (prawns in garlic), there were 6 whole langostinos, which had not been peeled, served on plate with the garlic oil drizzled over them. Not an issue if you’re not squeamish about peeling prawns! I was concerned that they may not have the flavour we so love from the oil, but boy I was wrong. The langostinos were cooked to perfection: succulent and steeped in flavour. The only thing we didn’t partake in is sucking the flesh and juices from the head of the prawn, something very common throughout Spain! The star of the meal though was of course that fillet steak with fresh foie. 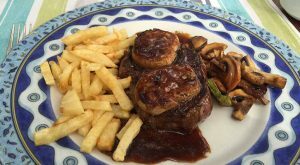 Served with a rich jus and accompanied by mushrooms and chips, the steak and foie just melted in your mouth – needless to say there wasn’t much conversation whilst we were tucking into this delight. Pretty full, we settled on sharing a pudding and chose tarta de queso con arándanos (blueberry cheesecake) and again we were not disappointed. It was refreshing on the palate with a real taste explosion from the blueberries. The setting, the atmosphere and the superb food really do make La Bodega de Santiago a special place to have a meal and it was a fabulous way end to our anniversary weekend.